Jim Schwartz said this week that Thursday's third preseason game, at Cleveland, would go a long way toward defining the Eagles' nickel corner and weakside linebacking positions, and that seemed to be the case. But maybe not in the way we'd anticipated. When Schwartz spoke, observers envisioned watching, say, corners Sidney Jones and Avonte Maddox split first-team reps against the Browns, maybe with some De'Vante Bausby sprinkled in. And the same for the WIL contenders – Kamu Grugier-Hill, Nate Gerry and Corey Nelson. Maybe they would rotate series by series, or something. Instead, Schwartz seemed to go into the game with the decisions made, perhaps looking for them to be ratified on the field. Jones got all the meaningful nickel snaps. Grugier-Hill played more defensive snaps (45) than any other Eagle. The Birds didn't often play the base defense that required a WIL, but if they did, he was it, and Grugier-Hill also got a lot of snaps as one of the two linebackers on the field in nickel. 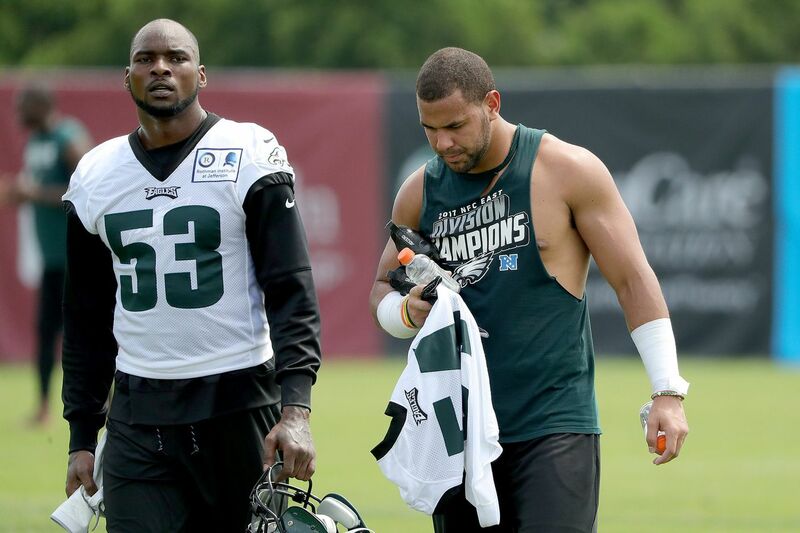 That buttressed something else Schwartz said – he was looking at more than the weakside position, he needed to put combinations together for the Sept. 6 opener against Atlanta, which starting strongside linebacker Nigel Bradham will miss because of a one-game NFL suspension. "Other guys have to step up and fill that [Bradham] role," Grugier-Hill said after the Cleveland game. "We're getting ready for Week 1. We're trying to just get the chemistry together and stuff like that." Grugier-Hill didn't want to say anything about the WIL competition. ("It's the coaches' decision.") He entered it as a dark horse; Grugier-Hill was a special teams standout for the 2017 Super Bowl season, maybe a little light for a linebacker (he said he played last season at 6-2, 215, vs. 230 now) and not quite as instinctive as you would prefer. "I think he's getting more comfortable in what we do," linebackers coach Ken Flajole said of Grugier-Hill earlier in the preseason. "He's still gotta smooth out a couple of things, but that's true with the whole group." In the offseason, the Eagles signed Nelson, at one year and $1.6 million, away from the Broncos, and that seemed to make them confident enough to release Mychal Kendricks, who ended up signing with the Browns. Nelson was mainly a special teams guy in Denver, but the Eagles thought he could do more. Instead, he has done less. We have just a week to go before the cutdown from 90 players to the regular-season limit of 53, and it would be a huge surprise if Nelson even made the team, much less started. Thursday, Nelson recorded five snaps on special teams, eight on defense. Coming into the game, Nelson said his goal was to "go out there and handle my job and just ball out." He was credited with assisting on one tackle. Asked earlier in the week how he felt things were going, Nelson said: "Hard to say. It's been pretty tough, I'm not going to lie, doing special teams and defense at the same time, the entire game, but that's what you have to do, especially when you're the new guy coming in, trying to crack the roster. "I've learned the defense, got that down, hands down. Understanding how it plays, I feel like takes a little bit more time. You have to really learn how they do certain things with certain calls, certain techniques, how they want certain things to be fitted, at a certain time. That takes time." Nelson's time might be up. The dead-cap charge for cutting him would be $600,000. Gerry, meanwhile, is in his second year of transitioning from college safety, the same journey Grugier-Hill began a year earlier. It's hard to say either Gerry or Grugier-Hill has been all that great at shedding blocks in the preseason, or that either has made a ton of plays, but they are solid special teams cogs who can play in the defense at least a little, and again, the Eagles don't play a lot in base. "I'm night and day from where I was last year, with overall scheme and the physical and mental part of the game," said Gerry, who was a fifth-round pick in 2017. "I've been moving around a lot, too. Being able to understand what other people do in their roles helps you know more about your role." Bradham has been the Eagles' best linebacker in the preseason, and it's going to be interesting to see how the opener works without him. Grugier-Hill apparently will be part of that puzzle, and Gerry might figure into it somehow as well.